Kent Yoshimura with his newly completed mural. Splashes of color brightened Hashimoto Plaza in Little Tokyo on Thursday. 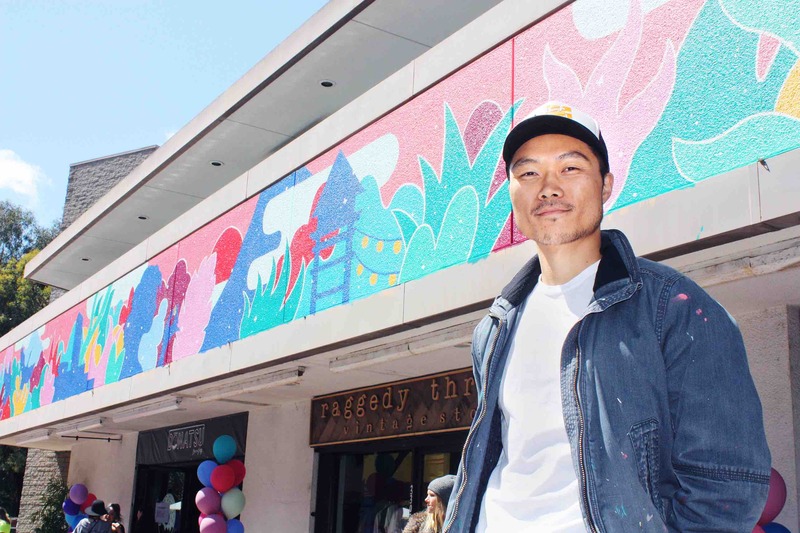 OPI, the California-based nail polish manufacturer, celebrated the launch of its new Tokyo Collection with the unveiling of a new mural by Kent Yoshimura. Left: The sign kiosk in Hashimoto Plaza was repainted. 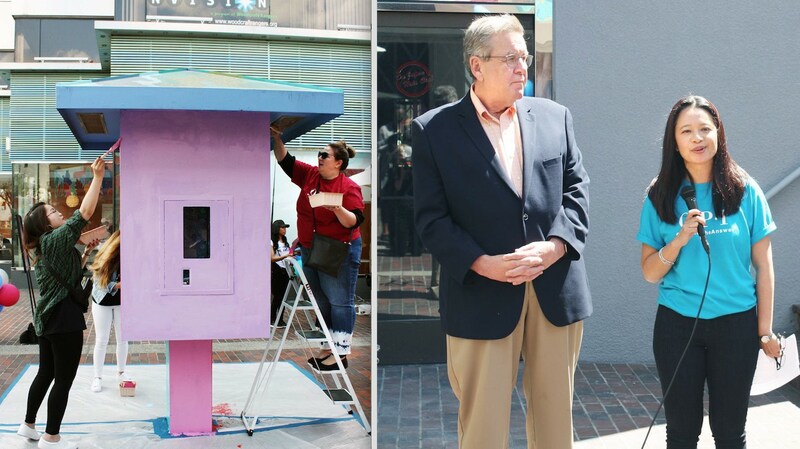 Right: Building owner Bob Beidl and OPI Global Vice President Patricia Malvar. Yoshimura’s mural, “Through the Blossoms,” is painted on the two-story building at 330 E. Second St., overlooking Hashimoto Plaza. The mural was created in conjunction with OPI, the Department of Cultural Affairs and Council District 14. Yoshimura, who was born in Nagoya, said the mural was inspired by Japanese folklore and Little Tokyo icons. In the painting are depictions of the grapefruit tree at JACCC, the late community leader Frances Hashimoto, the Ninomiya Kinjiro statue, Noguchi Plaza, and the yagura (fire tower). Yoshimura also painted the sign post at the entrance of Hashimoto Plaza on Second Street and “Distance Between the Stars,” which was showcased on Azusa in July 2016 as part of Sustainable Little Tokyo’s Azusa Street Pathways Project. The sign post also got a new coating of paint during the event. 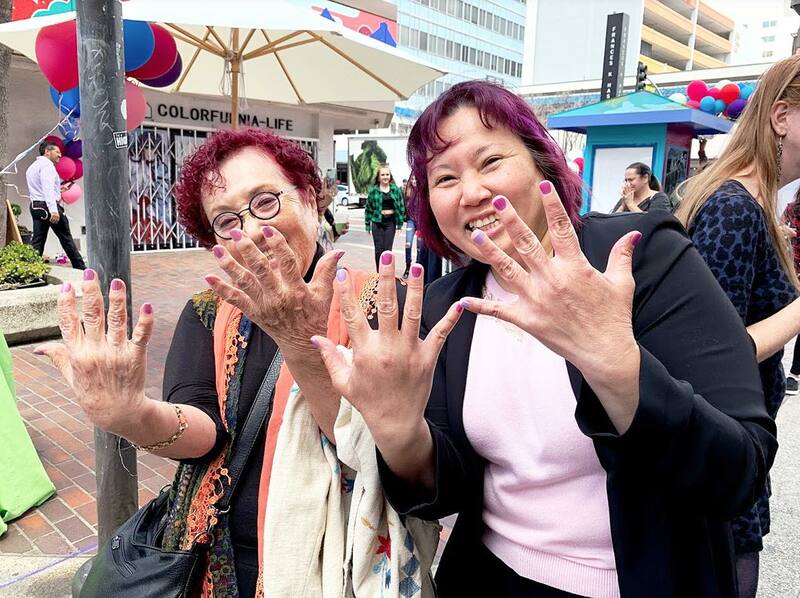 OPI offered free manicures to mark the occasion. 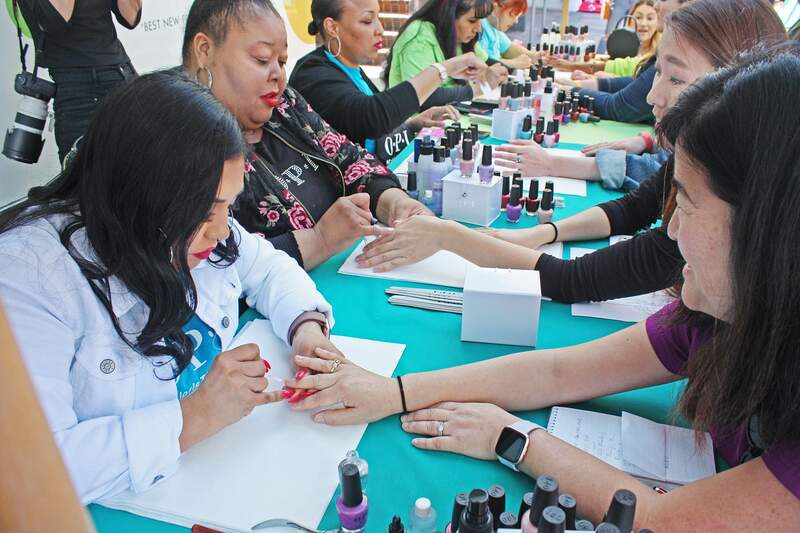 On Thursday, nail artists offered free manicures in bright OPI colors to celebrate the occasion. Yoshimura’s mural utilizes colors from the Tokyo Collection and other OPI colors. “One of the things OPI really believes in is the power of color. We see how much ipact it has on the woman who wears it. It affects their personality and how they’re feeling for the day,” explained Patricia Malvar, OPI global vice president.